Bright and airy maze (in the daytime at least) overlooks the excitement of Clarendon Street. 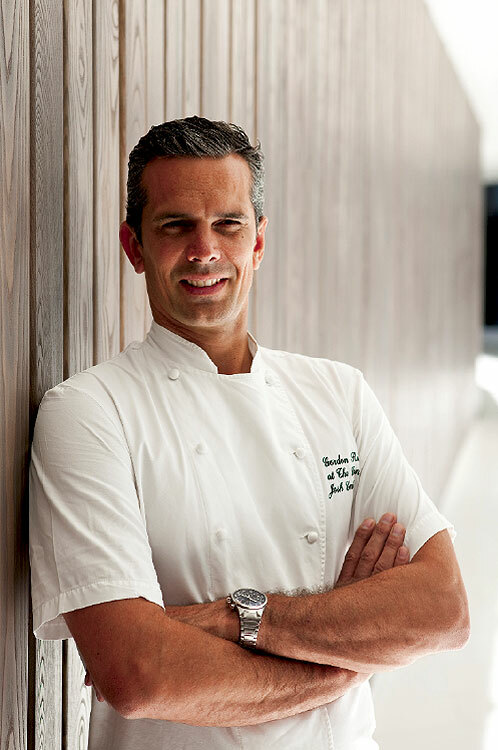 The world’s most famously foul-mouthed chef has opened Maze and Maze Grill in Melbourne’s new Crown Metropol. 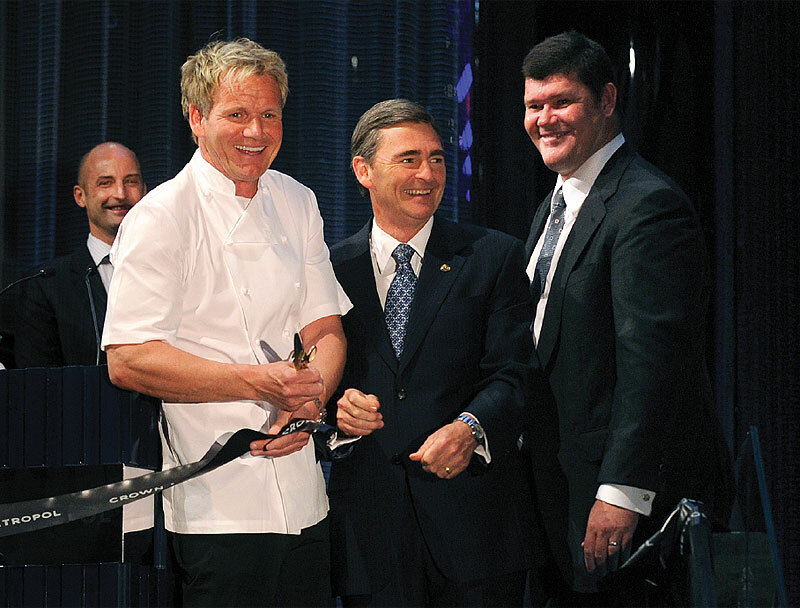 To find out if Gordon Ramsay has opted for style over substance, AT sent along the inimitable Peter Russell-Clarke – only to discover that for him, size truly does matter. Words by Peter Russell-Clarke, who paid his own way and visited as anonymously as it is possible to do when you are Peter Russell-Clarke. 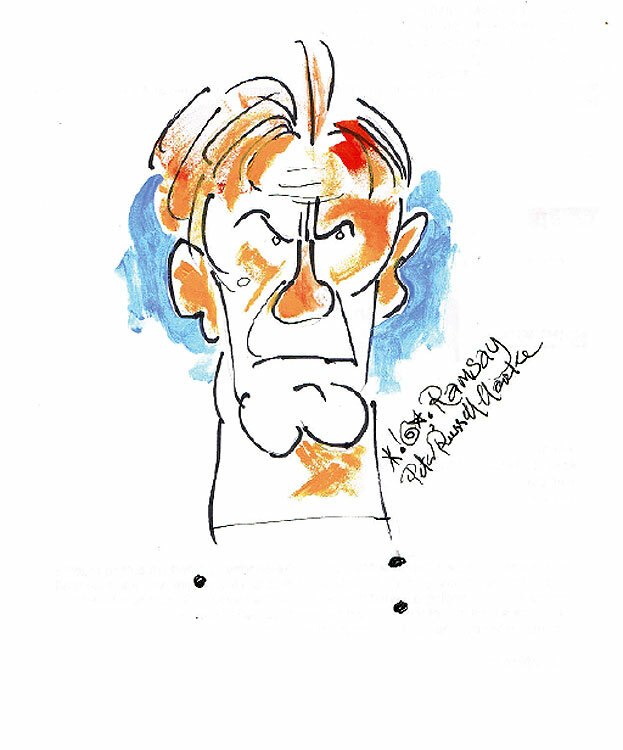 When you think of Gordon Ramsay at all, you think of food, foot-in-mouth (at least where Tracy Grimshaw is concerned) and the f-bomb – not necessarily in that order. I was recently forced to think of Ramsay quite a bit when AT suggested I took myself and my credit card to his new restaurant, Maze. A task easier said than done. The celebrity chef who made his name by oven-roasting the English language was not to be found among the pots and pans this evening. He was elsewhere, boiling down his personal and financial affairs – although he did appear, Merlin-like, the following night to officially open the Crown Metropol complex, within which Maze and the less formal Maze Grill are set. His Melbourne chef, Josh Emett, a Kiwi, was at the end of the saucepan handle. And a deft hand Josh has on any and all things culinary. To sum up: F**king excellent, as Ramsay might say. Except I’d like tablecloths and brighter lights. “Six-thirty or 8.30pm,” she insisted in a kind voice (the kind that asks, “Are you comfortable?” before the thumbscrews are given another turn). I tried explaining that my co-diners, who had already been confused by the various on/off dates, were unsympathetic to my ten attempts and would find 6pm too early and 8.30pm too late. I could more easily have talked a yabby cocktail into being lobster bisque. Now, gentle reader, I hope the above hasn’t caused you a flash of indigestion. If it has, the following will settle well with your gastric juices. The aptly named Maze experience starts from street level, as you blunder through a series of dead ends and wrong turns before thankfully arriving at your table. 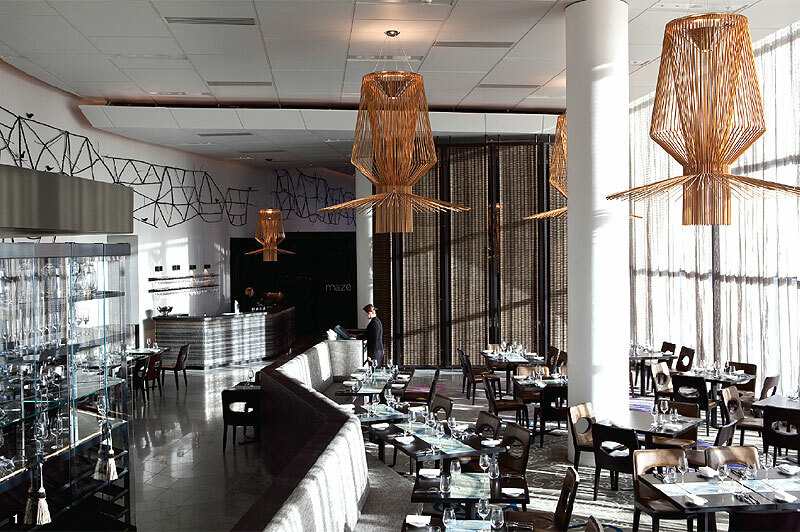 But first a stylish, imposing, hotel-style lounge serves as a muster room. A cocktail bar large enough to embarrass the long bar at the Mildura Workman’s Club dominates from behind a dividing screen. “Get thee behind me, Satan,” I mumbled to the samba-gyrating, cocktail-shaking barman as we were politely ushered into the holding area. Drinks 2009 Mt Horrocks ‘Cordon Cut’ Riesling, 2005 Mt Langi Cliff Edge Shiraz, 2008 Archer Shiraz, 2002 Brown Brothers Patricia Chardonnay, coffee, tea, beers. Once the senior Maze lady was sure we were suitably subdued, we were led, the four of us, two well-dressed and well-behaved couples, to a table smack in the middle of a massed herd of tables and chairs. I explained that we’d asked – American gunslinger style – for a table on the side, preferably with a window. Without so much as an exasperated hiss we were flitted to a corner table with wall-to-ceiling windows overlooking the excitement of Clarendon Street. The wooden, dark-stained, pub dining room-type tables kept us intimate. The wine glasses weren’t spectacular; the shiny metal cutlery stands were. You may be thinking that your reviewer was, by now, browned off. That’s not the case. But only because the entire staff was charming, young, attractive and choc-a-block full of industry knowledge imparted with grace and enthusiasm. That made it easy to forgive the big-pub arrogance of the ambience. The trio of welcoming lasses was delightfully gracious. The bevy of waitpersons exuded a friendliness that lit the room. Just as well, because the room sure needed lightening. The illumination was more than intimate; it was nearly non-existent. A miner’s helmet would have helped as I tried to read the menu by holding up one of our small fairy-like candles. But at least (as I now hear your plea to get on with it) I’d finally arrived at the menu. But before I do, I must inform you that I heard not one expletive from either the front of house staff or the kitchen staff (whom I was invited to meet, being the foodie that I am). But, in surprise, I nearly emulated Ramsey himself when I was confronted with a large, beer hall glass of draught European beer. But I kept schtum as my editor had instructed me to behave. Now, at last, to the food. The entrees hovered around the $16 to $18 mark. Very reasonable, I’m sure both you and I agree. The mains, from a choice of eight, started at $19 and topped at $24. Absolutely startlingly reasonable, you’ll concur. The desserts flicked from $12 to $18. ‘Strange,’ I thought. ‘The degustation menu of seven courses comes in at $95.’ So my merry mob opted for the main menu. “The serves are very small, no more than a taste, so we suggest you have at least two entrees and two mains,” we were told sweetly, albeit firmly. We obeyed. 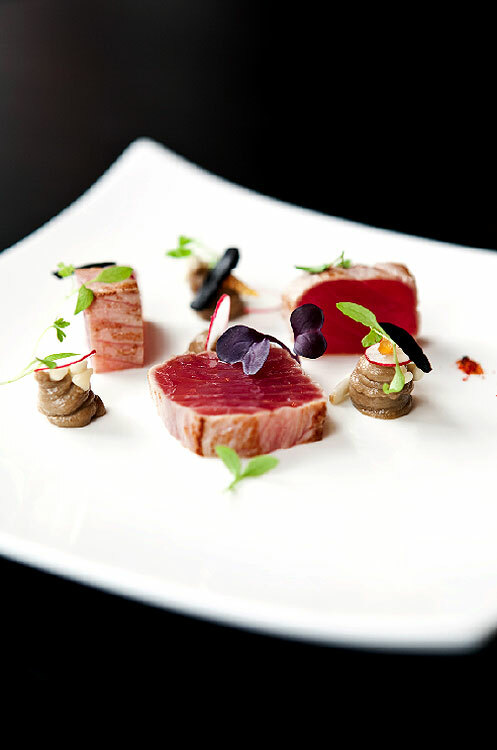 My young bride of 50 years had the miniscule serve of seared yellow fin tuna, white radish, yuzu, enoki mushrooms and black garlic. The tuna was perfectly seared, the radish as thin as a Catholic Church host, the mushrooms were somewhere in the black garlic dribbles and even though individually each ingredient was uninspiring, together they were a joy. Jan’s second entrée (by the way, the visual artistry of the food was exceptional – a miniature Blue Poles without the cigarette butts and bottle tops) was roasted quail, the portions as big as a blowfly’s leg. The black olive caramel, artfully splashed across the pristine white plate, turned finding the onion into a game of hunt-the-slipper. But, once found and identified, the onion out-gloried any slipper – even Cinderella’s. This was served with a junior rocket leaf. The quail portion, though small, was succulent and full of quail flavour. Ten out of ten – if you were one of those little people from Gulliver’s Travels. My applewood smoked kingfish, too, was a visual and gourmet delight (I’ll stop boring you with the microscopic size of each offering or we’ll never get to the finish). I couldn’t detect the smoke, applewood or not, the fennel puree had lost its fennel flavour and the pickled celery and globe artichoke were equally unobtrusive. Nevertheless, the combination made the whole taste experience enthralling. Young Josh had woven the strands of flavour into a fabric of style and subtlety. The Queensland mud crab sat on a thin cushion of pressed watermelon with pickled ginger and rockmelon sorbet. Exquisite. No single flavour dominating. I’d expected the mud crab to be a prominent feature, but it was the watermelon that gained my palate’s attention. Mind you, the crab was perfectly cooked, but like the Scarlet Pimpernel was here one minute then in the twinkling of an eye, gone. And now, what you’ve been sitting on the edge of your seat for: the mains. I did promise not to keep reiterating the extremely small size of the entrée serves and, unlike politicians, I will keep that promise. But, also like a pollie, I will come at the same argument through the back door. I will bring to your attention the fact that the main courses were the same petite offerings as the previous foods. Like the shrunken heads of African jungle fame, resembling in every detail a life-sized human head, so too did our mains resemble life-sized servings. Just observed through the wrong end of a telescope. Jan hungrily ordered two mains. The first was the coral trout wrapped in chicken skin, a thumb-sized portion of fish artfully held together by a whisper of chicken skin (jolly good), trompette royal (a mushroom infant), fennel and a summer shower of lemon thyme consommé. She rejoiced in its magic and, like all good magic, it vanished in the blink of an eye. You can detect a pattern developing, dear foodies. Very few individual flavours were prominent, but the blending of tastes that are simpatico with each other was brilliant. My slow cooked pigeon breast was from a Twiggy bird, certainly not a Marilyn Monroe. It was dressed in quinoa (a grain favoured by the ancient Incas and considered to be health building, though it didn’t help them against the Conquistadores) with honey (fortunately not Leatherwood with its distinctive, strong, overpowering flavour), which merged marvellously with Chardonnay vinegar and the gentle bitterness of juniper berries. Again, folks, whack-o the diddle-o. 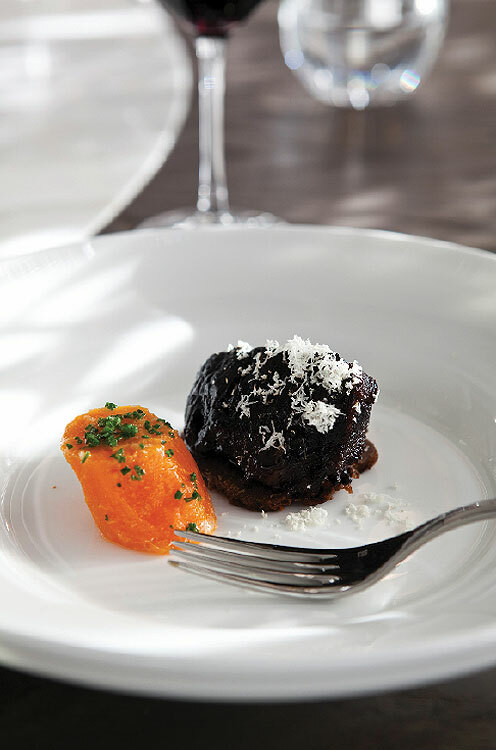 I would have liked to try the barramundi or the citrus cured king salmon, but I chose the ox tongue and cheek with caper and raisin, carrots and horseradish pomme puree. I expected to savour the smoothness of tongue and the softness of cheek, but because (again) the size of the serve was half a bite, my tastebuds didn’t have time to appreciate the true texture and flavour of the flesh from the instant it was in my mouth. I understand the rationale of Ramsey and Josh, or think I do. The small, exquisite serves allow the diner to experience more variety than if larger serves were on offer. But, my friends (and if you’ve kept reading to this point I’d say we’ve been together long enough to claim friendship), I believe that the palate needs at least two teeth chomps on the proffered food for it to reach a conclusion. For instance, my male companion was served a main of seared rabbit leg that didn’t leave a rabbit sensation on his palate. Not because the excellent almond and brown butter vinaigrette or the sliver of jicama (a crispy, sweet, turnip-like root) or green olive overpowered it (they, in fact, complemented it) but because the leg would have made Jiminy Cricket’s look like those of the jolly green giant. If you ate one solitary sphere from a bagful of hundreds and thousands, you’d be battling to give an educated opinion of its flavour, right? But even though the above makes you think you’d leave Maze hungry, amazingly enough that’s not the case. Once Jan and I finished the exceptional, really bloody good cheese platter, we were comfortably replete. Even though the quince paste was the worst I’ve ever eaten – old, dry and a niggardly squirt like something a sick bird did – the Pyengana cheddar from Tasmania was excellent, the St Agur Blue from France was absolutely magnificent, perfectly served at room temperature and one of the great cheese experiences. Will Studd’s Brillat Savarin from France was good-o, but to my palate completely overshadowed by the St Agur. And I was happy to observe that the cheese portions were adequate. Not a criticism, simply a suggestion, plain water crackers would serve the cheese better than the fancy things on offer. Even so, I asked for more of the not-up-to-scratch crisps. Our female mate ordered lamington with rosella jam. I thought Josh was brave to serve such a laughed-at Aussie food icon in his posh establishment. I applaud him for the smiles this brought to our table. And I applaud all the food we ate, with the above proviso. Would I go back? Certainly. But I’d need to either save up or have a special occasion. Our bill was $657 for food and wine. But since Australian Traveller footed the ticket, (or our half anyway), I was immensely pleased on all counts. Like all top-line commercial kitchens, Maze’s is endless stainless steel with dedicated, no-nonsense high priests and priestesses of the cooking craft concentrating solely on their tasks and not on some self-important, half-pissed interloper like me sticking his nose into their holiest of holies. The hustle and bustle was frantic, yet controlled. Impressive, the professionalism apparent and the pride obvious. Their results underlined the fact that all of their efforts were entirely what they themselves expected, and what their customers came for – with all the above orchestrated by executive chef Josh Emett. When I was a lad, Punch Magazine featured a cartoon under the signature of Emettt. He drew complicated contraptions that functioned because a chook laid an egg onto a plate which tipped, rolling the egg which knocked a trigger which actioned something else and so on and so on. Eventually whatever was supposed to happen happened. “Strewth,” I thought when I saw the name Emett as chef of Maze, “what are we in for?” Well, folks, Josh must not be related to the cartoonist Emettt. This Emett is a hard-nosed, knows-his-craft practitioner of the highest order. A good-looking, youngish man (to me anyway) who skippers a ship-shape vessel, with a steady hand on the helm and an experienced weather eye on the lookout for all contingencies. Neither too much sail nor rudder, yet enough to handle what was thrown at him, Josh could navigate a hurricane as confidently as a calm. His handshake was firm and encouraging. His smile sincere. Josh, of course, didn’t know I was reviewing him. In fact, he didn’t know me from a peeled prawn. Nevertheless, he greeted me with courtesy and consideration. A bloody good bloke and a bloody good chef. Other, less glorious publications than this, ruled by editors without the flair or vision radiated by my own leader (Get to the point, Peter – Ed), have scurried off their minions to scribble words relating to the Maze Grill. I lick read some of them as I unwrapped my flake and chips with vinegar. But, since I was eating in the salubrious section of the establishment, I thought it prudent to saunter below-decks, so to speak. Actually Maze Grill is on the same level as the restaurant, divided by your chequebook and a partition of sorts. The food is sourced (pun intended) from its own public-view kitchen that runs along one entire wall. Crisp, white-clad chefs, aping their colleagues in Josh’s command post, dodged each other as they flirted with the food. “Our oven was brought over from America,” one of them blurted to me as I strolled, hands behind back in the fashion of the Duke of Edinburgh (whom I cooked for on an oven from Brunswick, Victoria). The chef hinted, without words, that Ramsey could have emigrated the Statue of Liberty had he so desired. I spoke to a young diner who was, in earnest, attacking a char-grilled steak resplendent on a wooden platter (the steak, not the diner). “Just orlright, mate,” he chewed out his reply to my query regarding the splendid affair he’d been served. Moving on, I mused: good on Ramsey, or Josh, or whomever it was that decided to pioneer the wooden plate in Melbourne. Mind you, ever since Ali Oop served dinosaur cutlets wood has been used. The dining companions of that vulgar, fat English King who threw half-chewed stag bones over his shoulder while deciding which head of which wife should roll were known as trenchermen. (Good men on the tooth.) And their beef was eaten from wooden slabs. The custom crossed with the pilgrims to America, where they still cook and eat slabs of longhorn beef on planks of selected, scented wood. “Planked beef” it’s obviously known as. But I’m sure Ramsey wouldn’t follow the road workers’ choice of cooking steak. Once they’ve shovelled a morning’s worth of road mettle, they hold their shovels over an open fire and, when hot enough, throw on a steak and voila – it’s cooked in no time. I don’t believe they eat the meat from the shovel, so maybe that’s why Ramsey’s not taken up the idea. Anyway and regardless, I think Maze Grill looked okay. But would I go there? Probably not – there are plenty of great bar-and-grills to eat at without being paraded through the want-to-bes of Josh’s domain. To sum up: f**king excellent, as Ramsay might say. Except I’d like tablecloths and brighter lights. But if that’s all you can find to complain about, you’ve done well. Oh, and the size of the offerings. But that, too, is contentious, eh?